“Communication is vital to people’s wellbeing especially when getting older and more physically isolated. However after detailed observation it became clear there are gaps in the way different generations communicate with each other, resulting in different generations being cut out of conversations. Younger people are more technology savvy, using texts, Twitter, Facebook, etc, compared to more traditional methods such as letter writing and phone calls. I designed a letter printer called ‘Relative’ that receives emails, text and picture messages and prints them out as a physical letter similar to a postcard. This postcard format was seen as the physical/analogue equivalent to the digital text message. ‘Relative’ bridges the gaps in communication by connecting different forms of technology. 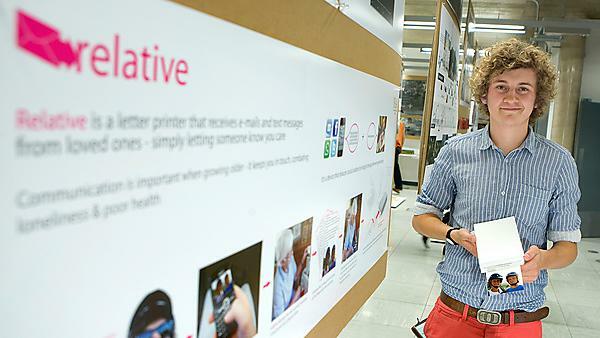 The design won the Royal Society of Arts (RSA) Student Design ‘Modern Age’ Award and strengthened my design experience.